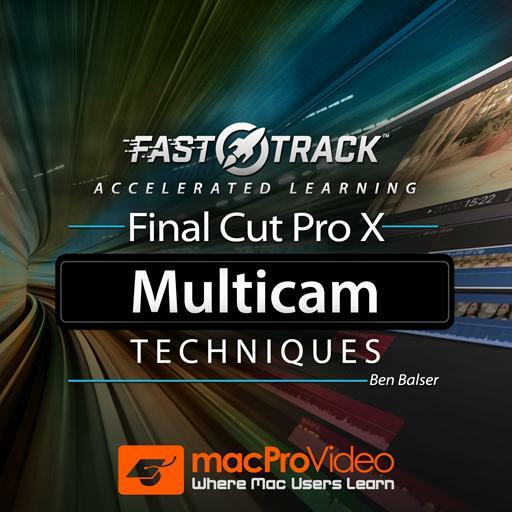 Final Cut Pro FastTrack 202 - Multicam Techniques. Is it best to record audio from every camera during a multi-camera shoot? Yes, audio must be recorded from one single, high-quality microphone to all cameras used. No. All video cameras record the same synchronized timecode that Final Cut Pro uses to sync clips. If the time and date is set on each camera, there is no need for any audio or timecode at all. Absolutely, as long as it is decent quality sound, even from the built-in camera mic. What is the safest and easiest way to cover up jump cuts in a Multicam that’s been edited in a timeline? Use connected clips as cutaways. Is Final Cut’s Multicam editing feature limited to only 2 camera angles? It is limited to 2 angles because Final Cut Pro can’t run more than 2 video streams at once. No, Final Cut can support up to 8 angles ("cameras") in a Multicam clip. The Angle Editor is the best place to do what? Remove large gaps between shots. When would you duplicate the Multicam clip versus duplicating the Timeline? It doesn’t matter, they both provide the same function. Duplicate the Multicam to make Angle Editor changes; duplicate the Timeline to alter the Timeline edits. Duplicate the Multicam to make timeline editing changes; duplicate the Timeline to make Angle Editor changes. You can’t duplicate a Multicam Clip at all in Final Cut Pro. What is the easiest way to find your Multicam clips in the Browser? Type “multicam” into the text search field. Be sure to give all Multicam clips the same name, type that name into the text search field. Create a new Smart Collection, rename it, configure it for Multicams only. Scroll through the list of clips in the Browser in list mode, looking for the Multicam Clip icons. What method is most efficient when copying a color correction or other effect from one clip, and pasting it to the same camera angle in a timeline? Use the Timeline Index's “Angle” column to select all clips of the same angle. It isn’t possible to perform this operation in Final Cut Pro. Manually scroll through the Timeline and Command-click to select them all. By using the Angle Editor for that single angle. When matching color between camera angles in the Angle Editor, what is a good first step? Rearrange Angle order so that the least saturated clips are lower than the highest saturated clips. Color grade one clip, then copy/paste that to all other clips, immediately. Color correct each clip individually on its own. When creating a Multicam clip, FCP can use any of these for syncing. In order, what do the outline colors Yellow, Blue, and Green signify when switching Angles in the Angle Viewer? Video only, audio only, neither audio nor video. Video only, audio only, both audio & video. Audio-only clips, Video-only clips, active angle. Where is it best to configure the audio channels of individual clips within a Multicam clip? You can’t configure audio channels in a Multicam clip. What is the default edit tool for a Multicam clip in the timeline, and why? Slip, because sometimes Multicams are usually not in sync anyway. Ripple, because it allows you to get rid of content you don’t want easily. Ripple, because that’s how Apple designed it. Roll, it is the only edit type that will not make clips become out of sync. What does the 'Automatic' setting use to sync clips when creating a Multicam clip? The start of each clip. You have answered 0 out of 13 questions.